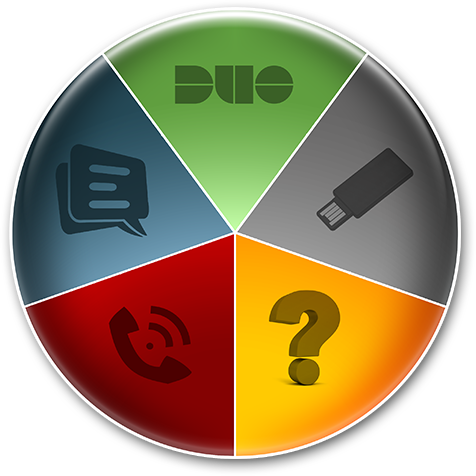 Install the Duo app on your Smartphone or Tablet, and use that as your primary method. Purchase and register a hardware token. Lost, misplaced, disabled, or broken device? Contact 4Help for a bypass code to enable you to connect until you can register another device. Use a cell phone or landline to authenticate via phone call. Use your cell phone to receive a list of ten passcodes. Virginia Tech uses Duo Security to ask individuals for a secondary confirmation of their identity at log-in, using a physical device in their possession. The device may be a smartphone or tablet using an app, a text message to a phone, or an automated voice call to landline or cell phones. When you log in as usual (with your ID and password) to access services using the new procedure, you will be prompted to enroll. To enroll: Select the devices you plan to use from the menu. Registering two or more devices is recommended. Because they can receive information in multiple ways, one of these devices should be a phone. Enter your device information. If you are enrolling a smartphone or tablet, you will be asked to install an app from your appropriate app store. For details on which devices can be used, click here. As before, log in with your ID and password. Select which of your enrolled devices you wish to use. Click "login." Depending on which device you selected, this will activate the app on your smart device, send a text with a numeric code, prompt you for a passcode, or ring a phone in your profile. Follow the simple instructions for each method to complete the process. You may add or remove devices from your profile by selecting “Manage devices.” on the Duo system screen, and following the prompts. For assistance with enrolling or using 2-factor authentication, submit a question to www.4help.vt.edu or call 540-231-4357. Click here to review a list of frequently asked questions. In response to recent phishing scams and related vulnerabilities, Virginia Tech is implementing a high-security login process referred to as 2-factor authentication. An attack on your password isn't enough to allow unauthorized access to information when logging in also requires use of a physical device. 2-Factor Authentication is mandatory for all students, faculty, and staff at Virginia Tech. If you have not yet enrolled, please take a few minutes to do so! In addition to our 24/7 information and support services available through 4Help, we also have three permanent locations where you can go to get assistance or answers to your questions about 2-Factor Authentication. For details, click the ‘Help Locations’ tab above.